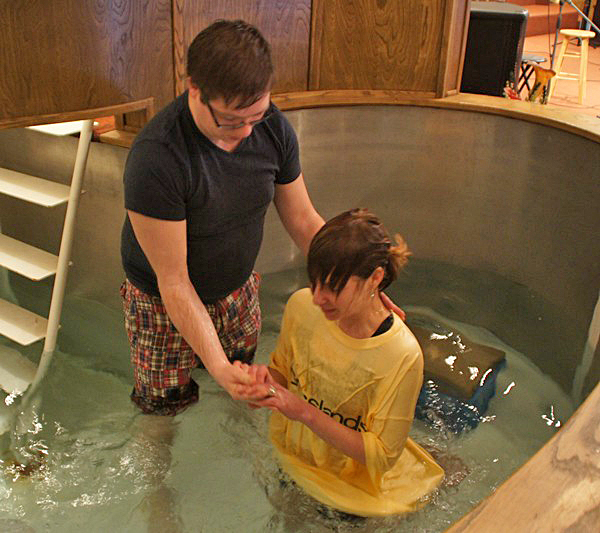 Jenn is baptized at Grasslands Church, a Grace Brethren congregation in Medicine Hat, Alberta. From Grasslands Church, a Grace Brethren congregation in Medicine Hat, Alberta, (Bart Blair and Oliver Edwards, pastors) is news of a baptismal service on Sunday evening. The Grasslands family gathered at the Southview Church of God building to celebrate the commitment that two of our family members, Jenn and Claire, have made in their journey with Jesus. Claire began attending Grasslands about one year ago, and Jenn joined us last fall. Both ladies have participated in Grasslands’ Discovery Groups and are serving in the children’s programs on Sunday morning. Claire assists in the nursery. Jenn is on the Lil’ KidZone team. Jenn shared the story of how she came to a place where she recognized that the ‘living water’ that Jesus offered was desperately something she wanted and needed. This propelled her to move ahead in placing her faith in Him. Claire spoke of a church background in which she had a faith in God but viewed herself as a “user” – only really praying and calling on God when she was in need. Recognizing that Jesus has made a way for her to have an active, personal relationship with God has given her confidence to place her faith in Him and walk with Him daily. We congratulate these ladies on the public declaration of their faith and we pray that God will show them they way to fulfill their potential in His plan for their lives.